Today in Masonic History William Robb Eaton is born in 1877. William Robb Eaton was a Canadian-born American politician. Eaton was born on December 17th, 1877 in Nova Scotia, Canada. In 1878, Eaton's parents moved with him to Boston, Massachusetts. In 1881 they moved to Denver, Colorado where Eaton attended local public and private schools. Starting in 1889, Eaton worked as a bank clerk. He held that job until 1901. From 1901 to 1909, he worked as a jobber, a person who works a variety of odd jobs, and a wholesaler, selling bulk goods. During this same time, from 1898 to 1904, Eaton served in the Colorado National Guard. In 1909, Eaton graduated from the University of Denver law department. That same year he oped a private law practice and served as the Deputy District Attorney of the second judicial district. He held the position of Deputy District Attorney until in 1913. 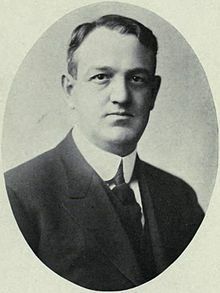 In 1915, Eaton began his political life when he was elected to serve in the Colorado State Senate. He served in the Senate twice, the first time was from 1915 to 1918. The second was from 1923 to 1926. In 1928, Eaton was elected to serve in the United States House of Representatives as a Republican. He served in the House from 1929 to 1933. He was unsuccessful in his bid for reelection in 1932. After leaving the House of Representatives, Eaton returned to his private practice in Denver. Eaton passed away on December 16th, 1942. Eaton was a member of Union Lodge No. 7 in Denver, Colorado. He was also a member of Colorado Chapter No. 29, Royal Arch Masons, Denver Commandery No. 25, Knights Templar and Colorado Consistory No. 1 Ancient Accepted Scottish Rite, Southern Masonic Jurisdiction. He received the honorary title of Knights Commander of the Court of Honor (KCCH), an honorary titled bestowed on members of the Ancient Accepted Scottish Rite, Southern Masonic Jurisdiction for service to the craft and the community.